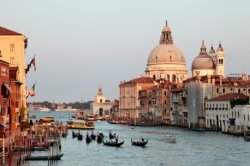 Europe is the number one destination for tours (UN World Tourism Organization), and the kinds of tours offered has something for everyone: over-the-road bus tours, adventure bicycling and hiking tours, river boat cruises, theme tours (e.g., cathedrals, battlefields, even quilting tours). If you can imagine an itinerary, you likely can find a tour operator who offers such a tour, or will create one upon request. Sound interesting? Imagine yourself in Provence in southern France, bicycling past fields of lavender, stopping in small villages to savor the afternoon sun, moving slowly and deliciously through picture-postcard scenery. Or board a river boat, cruising from Amsterdam to Budapest, Paris to Prague, stopping at towns along the way to shop and dine, returning each night to your floating hotel. Or travel by bus from Paris to the beaches of Normandy, walk the cemeteries there, honor those who gave everything in the fight for freedom. Return to Paris by way of the chateaus of the Loire River Valley. Imagine yourself the tour director or tour leader on these expeditions. Your job is as it is on every tour, to both manage the details elegantly, and to provide opportunities and experiences for your guests that maximize their enjoyment. If you speak the language, so much the better. It may be the reason you were offered this job. Some tour companies hire only English-speaking TDs so that English-speaking guests always will have someone who understands their requests. Such a tour director who also speaks the local language on a tour will be viewed as that much more of an asset. Tour operators typically will transport tour directors to Europe (and back), and then require them to remain there on assignment for, say, 100 days, often giving them back-to-back assignments to make the best use of this resource. If there is time between tours, tour directors can travel at their own expense, expanding their European experience. Tour operators may be US- or Europe-based. Oftentimes, a European-based TD will require that the prospective tour director have a right-to-work document, the equivalent of the American green card, in order to stay beyond a certain number of days in that country and to work there. Other tour operators, both U.S. and European-based, hire only native speaking Europeans with a near-native command of English to conduct the tours, and they handle both the logistics and the commentary. This is becoming increasingly common, as English becomes the universal language. Where to stay when not on tour can be an issue. Some tour operators provide dormitory housing for TDs between tours, other times TDs must arrange their own housing. American and Canadian tour directors may find that their job is only to manage the logistics, and local commentary is provided by a succession of local guides. Yet a wise TD will always prepare commentary, no matter where the tour. Many European countries require the use of licensed local tour guides anywhere in their country. The training program for obtaining a license is extensive, and the test is rigorous. Guests report on surveys that they much prefer local guides to provide commentary as they travel.